From under cover pergola to the double deck, it’s energy efficient abundance. Peka Peka is a great example of where smart design can create a home that delivers all the spaces you need on a much smaller footprint. 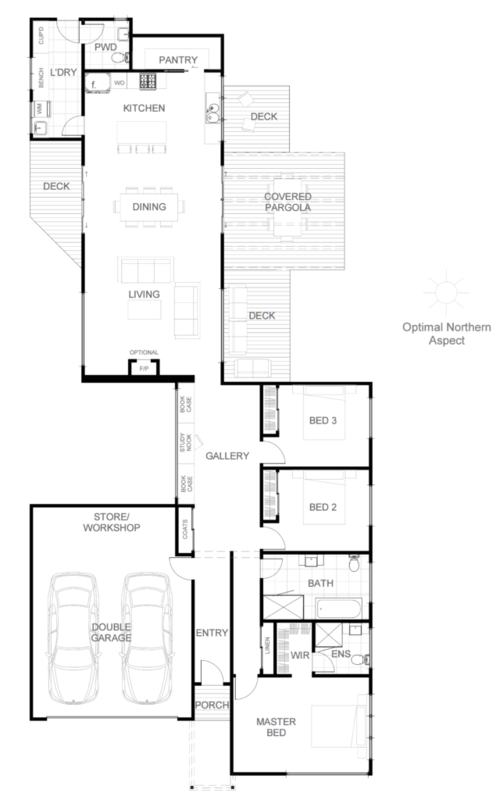 This design offers 3 bedrooms, 2 bathrooms and a powder room, gallery with study nook and a double garage with store and workshop or store area to the garage. As you journey through the design you will find that outdoor living is a key feature of this home, with two deck areas and pergola. The central hub of the home, which includes living, dining and a large kitchen, leads directly onto these outdoor areas providing an abundance of space for all to enjoy.